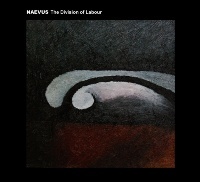 Much has changed and much has stayed the same with The Division of Labour, the new album from the much underappreciated Naevus. Seven albums on, we find both Joanne Owen and Greg Ferrari who between them supplied bass, accordion, and electric guitar to previous Naevus releases now gone. What remains is songwriter and vocalist Lloyd James. The acoustic guitar central to the Naevus sound remains too, but it doesn't now always feature in Naevus songs. Instead, as a solo project, Lloyd James has been given free rein to give greater prominence to the electronics within the Naevus sound. This, however, has the effect of blurring the distinction between Naevus and Lloyd James's experimental project Retarder. That's an observation and not a criticism, if you're wondering. Acoustic short-story narratives can still be found on The Division of Labour alongside short-sharp minimal post-punk songs. Lloyd James's cryptic lyrics of urban realism, fractured perception and obtuse personal introspection are delivered, as ever, in his customary well mannered tones. His vocal delivery style, part-spoken, part-sung, is particularly suited to the resolutely abstract and clever lyrics. Naevus releases have always been good; this one, however, is great. The Division of Labour enters with elongated drone and ringing guitar distortion from which the acoustic strum rises with Lloyd's pensive sing-speak melodic tones. With layers of guitars continuously added and cut away 'Man In A Ditch' is an impressive opener. Arriving with a knock 'Idiots (Let Me In)' explodes into live wire clipped post-punk riffing shot through with electronic effects. Naevus have always operated at the artier end of the dark-folk scene co-opting the influences of Magazine and Wire into their sound, and given several Naevus albums have featured these brash moments of minimal riffing 'Idiots (Let Me In)' certainly rates as one of their finest. The urgency captured within 'Man In A Ditch' is carried over into 'Bleat Beep'- containing a clever lyrical nod to Joy Division. With sweeping guitar strokes heightened by frantic drums, the deadpan voice of Lloyd James remain controlled as it rushes headlong into the staccato rhythm of the "Bleat, Beep" chorus shadowed by buzz chords. New Naevus listeners might even wonder at this point where the dark folk comparisons that surround Naevus ever came from. The answer comes in the form of 'Making Hay', a lilting acoustic ballad, bolstered by a loping bassline, drum rolls, and an appealing organ drenched sound. This short-story narrative shares a musical kinship with 'The German' from the previous Naevus album Relatively Close To The Sea. Lloyd James's refined vocal style is a good fit for these story telling tracks which in this instance casts the need for creating art against the drudgery of work. Naevus seem to be taking their sound into new areas with 'The Stomach' (a track originally recorded by Man Eat Man Eat Man) which finds a much starker Naevus sound with brooding ringing acoustic chords rising into a soaring shoegazey guitar lead with soothing tones softly pleading "how much longer". What holds it together as a Naevus song is the distinctive smooth voice of Lloyd James. That's true of 'Song In Suspension' too, where his melodic spoken vocal is delivered over a sparse arrangement of minimal programmed drums and soft bass tones which are almost jazzy in nature, until the drum rolls and distorted guitars kick in to lead the repeated lyric to the end. The Division of Labour really takes a turn towards Lloyd James experimental work as Retarder on 'Hobo Placing' with its grating, beating electronics and slabs of shredded guitar distortion that comprise the backdrop for Lloyd's oblique spoken word. 'Donkey's Trough' returns to a more song based approach with acoustic guitar soaked in reverb with the entire track shrouded in bird calls. There's a pastoral Englishness to its psychedelic introspection with its references to cricket on the lawn. And while 'Donkey's Trough' plays out pleasantly, the closer, 'Chalk is Valuable, Keep it in Your Hand', is unremittingly awkward. Given a fresh airing in acoustic form this minimal version is wildly different to the monolithic stop-start Retarder version as found on their Enquiries album.